In 1924, Skurjeni began copying oleographs, often of religious images, by making drawings on packing paper, which he would then color with wall paint. Skurjeni, however, was still considered a craftsman rather than a professional painter. In 1945, he joined a Workers’ Cultural Society headed by Vinko Jeđut that hosted evening courses funded by its instructors. The classes, which lasted until 1949, sought to instruct individuals about formal artistic techniques and initiate artists to the socialist realist movement. Skurjeni’s paintings from this time period reflect the movement, featuring figures with a more traditional, proportionate anatomy. 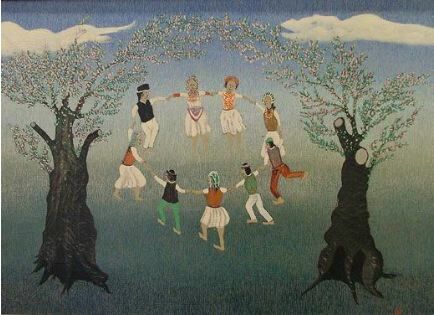 Yet, the Cultural-Educational Societies of Zagreb’s art sections considered Skurjeni’s art too primitive, and it was never exhibited in their shows in the 1950s. Skurjeni found national artistic recognition following his retirement from the State Railway in 1956. The Belgrade Exhibition Pavilion opened the first exhibit of Yugoslav naïve artists in 1957, in which Skurjeni’s work “Zaprešićka rampa” (Zaprešić Ramp) appeared, thus launching him into the realm of professional artists. He began to receive international recognition as he exhibited with Vinko Jeđut and other Yugoslav Railways employees. During the next several years Skurjeni forged a strong relationship with the Zagreb Gallery of Primitive Art and its director, Dr. Mića Bašičević, with whom he often collaborated. From 1958, Skurjeni's style distinguished itself from other naïve painters through his paradigmatic work. In the early 1960s, Skurjeni associated with the avant-garde artists of Zagreb who called themselves the Gorgon. He participated in their first exhibition entitled “Salon G” and then continued to use the Gorgon motif throughout his career, including pieces such as: “Gorgon,” “In the Honor of the Gorgon,” and “The Gorgon Castle.” However, while associated with several avant-garde artists, Skurjeni’s style never conformed to the movement. In 1964, Skurjeni helped found the Association of Independent Naïve Artists of Croatia. The artist fell ill in 1975 and ceased painting. In 1984, he gave some of his paintings and sketches to the municipality of Zaprešić, building the foundation of the Matija Skurjeni Gallery. He died in Zaprešić on October 4, 1990.